For as much history as there is surrounding the Cardinals, it was surprising to see the list of players and coaches who have donned the #8. For a time in St. Louis it appeared that the number was swapped just about every season or a few different rookie players started their careers in it before transferring to something else. The single digit has also been a favorite of the coaching staff over the years as well as for one current big league skipper. We aren’t going to be directly looking at anyone on the list today, however, as this is the perfect opportunity to show some Countdown love for the man who is responsible for putting the Birds on the Bat on the current occupant. He is also pretty popular with bloggers too, taking time out every season to answer even my questions. John Mozeliak has been the architect under the Arch since October of 2007 and deserves just as much praise as anyone in the organization for the current run. 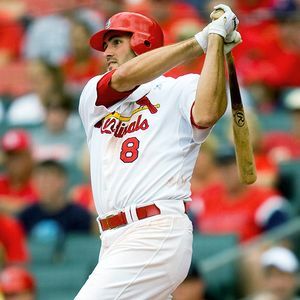 Glaus was the first big acquisition made under the Cardinals’ new direction if you will, but Mo will be remembered for many more before his tenure is over. As long as St. Louis keeps building a strong clubhouse, characters like Punto and key fits such as Bourjos show that the DeWitt family has the right man leading the way. In order to obtain the 12th title for the franchise, Mozeliak will need to pull off more deals just like he did last summer involving one more former #8. No one saw the Craig deal coming in the way that it did, and maybe that is what sets apart this particular General Manager from his competition. We live in a world of instant gratification, but the man with the bow tie plays by a different set of rules. If there has ever been a better time to be a fan, I’m at a loss to come up with one and as always, In Mo We Trust!